I had my first girls trip in India! We went to Ranthambore National Park on a "tiger" safari! It was an interesting/exciting/frustrating/memorable trip, as most things in India are. I was glad to be able to travel with friends I've made here, and enjoy some rare female independence. Our trip started in Jaipur with a three hour car ride to the park. I went with my friend Marcela, her son Gabrielle, and Marcela's friend from Bangalore, Gabriella. Here we are on our way with Marcela's driver. In case you're curious... when your driver takes you somewhere out of town, you pay for your driver to stay in a nearby hotel. Without him our trip wouldn't be possible. It is also great that Marcela's driver, like mine, speak great English so they can always help us translate in tricky situations. Plus, he almost never uses the car horn. Music to my ears. Our hotel only cost about $40, so you can imagine the conditions. 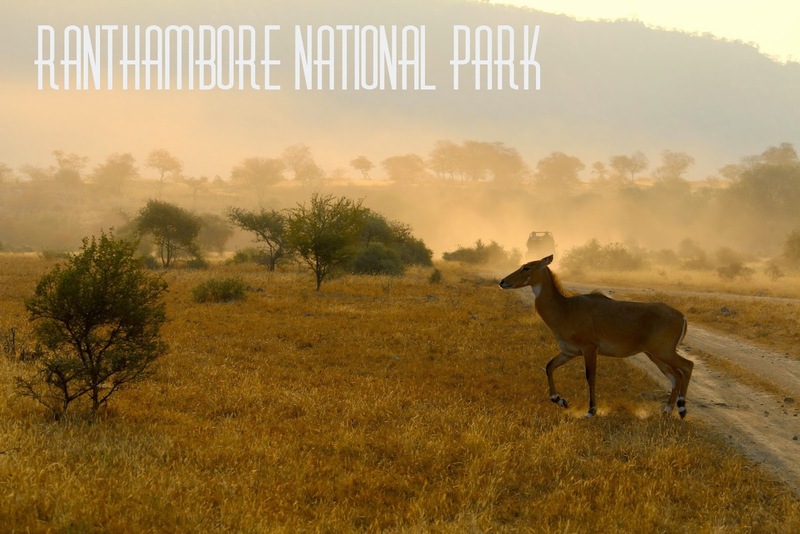 Ranthambore is essentially in the middle of nowhere so your options are really limited. There are two hotels which are large chains, the Taj Hotel and the Oberoi Hotel. But since it's peak season, these hotels cost upwards of $700...absolutely crazy! So if you aren't in one of those, you're taking a chance, which we definitely did. The sheets had some holes, but appeared clean-ish. The door kind-of locked even though someone from the front desk found it appropriate to just walk in without even knocking. (Trust me- I threw a fit about this at the front desk and also made sure to note it in my TripAdvisor review.) Overall it was a place to play Uno, eat a ridiculous amount of cookies and Pringles, and attempt to sleep. A lovely rooster outside our window gave us a nice 5am wake-up call. Our safari adventure started early the next morning at 6:30am... or at least it was supposed to. Since we are on India time, the safari didn't actually pick us up until 7:00. Staff from the safari tour and the hotel came to meet with us FOUR times the night before to tell us to be in the lobby at 6:30. I would've thought they'd make more of an effort to be on time. The whole point of the safari was to see Tigers. I can see a zoo on the streets in Jaipur every single day with cows, donkeys, elephants, camels, etc. etc. So we were really excited to find Tigers. The beginning of tourist season was also part of the issue. With dozens of jeeps, probably a hundred within the entire park, it's no wonder the tigers were scared away. Marcela's souvenir hat was a smart purchase! My hair was a mess from the wind and all of the sand. My camera is actually completely covered in dust and sand, so if you have any cleaning suggestions I'd love to hear them! Even without seeing Tigers, Ranthambore was still a good trip.. Even Gabi, who had his binoculars out the whole safari and was so excited to see a tiger, had a great attitude. He LOVED the hotel. He LOVED the jeep. He LOVED everything! His spirit about the whole thing helped me put my own attitude into perspective. There were so many tourists in jeeps having the time of their life because they had just arrived in the country and had not yet had to deal with the crap we experience as foreigners who live here. Their ignorance forced me to put on a smile and at least try to pretend I cared about the monkeys or stray dogs in the park. And you never know, I could still see a rogue tiger on the streets of Rajasthan some day. Checkout our package golden triangle tour with ranthambore !